The day started in my condo in Eldersburg, MD. 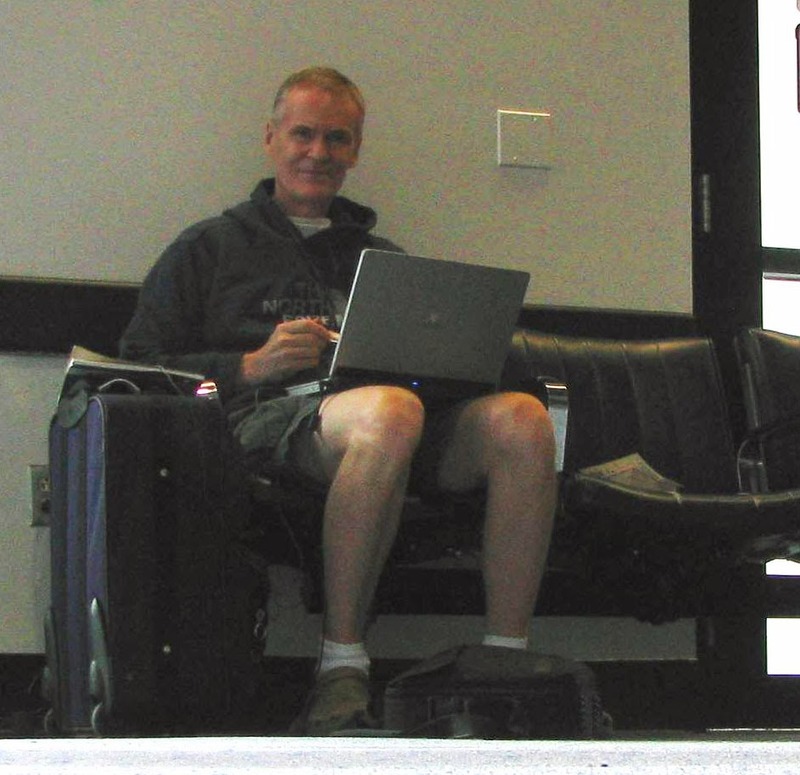 I had my gear packed and ready for my flight--a huge duffel bag, my Osprey Aether 70 backpack, a full-sized suitcase, and a carry-on suitcase. Climbing 20,000+ foot mountains requires a lot of gear. I tried to read a bit of Tolkien's Silmarillion as I waited for the airport shuttle to arrive. But I couldn't concentrate. The excitement and anticipation was just too intense. For the past five months I had been religiously training for this day--climbing 1700 foot Bob's Hill in Cunningham Falls State Park multiple times per day carrying 50 pounds of water in my big Osprey backpack, and, when the weather got worse, doing interval training on the treadmill in my local gym with incline set at maximum and with the 50 pound backpack slung over my shoulders -- 90 minutes of hard pushing every other day. Interval training expands one's aerobic capacity and simulates the thin air of high mountain conditions by repeatedly putting the body in oxygen debt. The basic element of this training--the interval--consists of about one minute of maximum intensity work--all out sprinting--followed by two minutes of steady hard work at near aerobic capacity. Repeat, repeat, repeat. At the age of 61 I was in the best physical shape in my life--by a country mile. I was a machine. And I needed to be. The goal was to climb the second highest mountain outside of the Himalayas--Ojos Del Salado - 22,615 feet high, located in the Atacama Desert on the border between Chile and Argentina. The shuttle van finally arrived at 10:55AM. The driver had already picked up a family of four--Ma, Pa and two young girls--headed out for a Florida vacation, and there were no other pick-ups, so I got to the airport ridiculously early. They advise international travelers to arrive well ahead of time, and I didn't want any glitches to mar this adventure. I began my check-in 3½ hours before the flight was scheduled to take off. I had heard warnings about horribly long lines to get through security, particularly for international flights, but this day, for this flight, the check-in line was very short. I checked my heavy bags and got my boarding pass quickly, using the self-check-in process on the screen. They offered me an upgrade to First Class on the leg to Miami for $90. Now flying first class was not exactly a bucket list item but it was one of those things on my informal “things I’ve always wanted to try once” list. So I splurged. After all, this was going to be the trip of a lifetime. Why not start it out with flair. I found that there was no line at all getting through security! Good omen. But with little to do, the security offers were very thorough. I had packed a jar of fiber and two jars of lemonade mix in my carry-on luggage. It looked suspicious to the x-ray scanner lady, so a TSA security officer took me aside, had me open the suitcase, and proceeded to do a manual chemical test on those ‘powdery substances’. They did a physical check for residue on my hands too. I noticed an active pat-down and body scan area, but I guess I had already passed the 'suspicious person' test, so got waved past that stop. All in all, it took me only fifteen minutes to get to my gate, so I had a full 3 hours to wait for my flight. That was fine--I looked forward to reading Silmarillion and possibly even paying for the Boingo airport wifi service. So the second good omen was that I found plenty of uncrowned spaces in the concourse--the scaling back of flights with the bad economy meant that they had unused space. I found an isolated seat right near my gate with a convenient nearby outlet. I took a self-timer selfie sitting there on the laptop. Third good omen: I got out my laptop and checked for the price of the wifi service and found that Google was sponsoring a free wifi connection for the holidays--through January 15th! So I got on the internet and got on Facebook first to add an entry there. Back then Facebook only allowed 420 characters in a posting--does anybody remember that? I posted the photo at left then checked weather and email and got off the internet and caught with my personal journal. 1:40PM, and I had finished the essential computer activities - still long before my 2:50 boarding time. I ate a package of crackers. I did some time-wasting browsing. I went to the bathroom. Then I settled down at my gate and read Silmarillion until boarding time. It was a peaceful time. I felt like I was on vacation already. The plane arrived late and boarded half an hour late because of a medical emergency on the leg before arriving at BWI. But American Airlines was hurrying the process along, so they made up some of the time. My first class seat was the back left one--a window seat. I love window seats. I remember my very first airplane flight back in the early 1950's--from Delaware to Wisconsin in an old prop plane. I sat with my nose pressed against the window watching the tiny world below pass by, utterly enchanted. I'm still that way. I luxuriated in the wide, cushy leather seat with nothing but a partition wall behind me, took advantage of the on-demand food service. For $90 I got some warm nuts and a warm cookie. 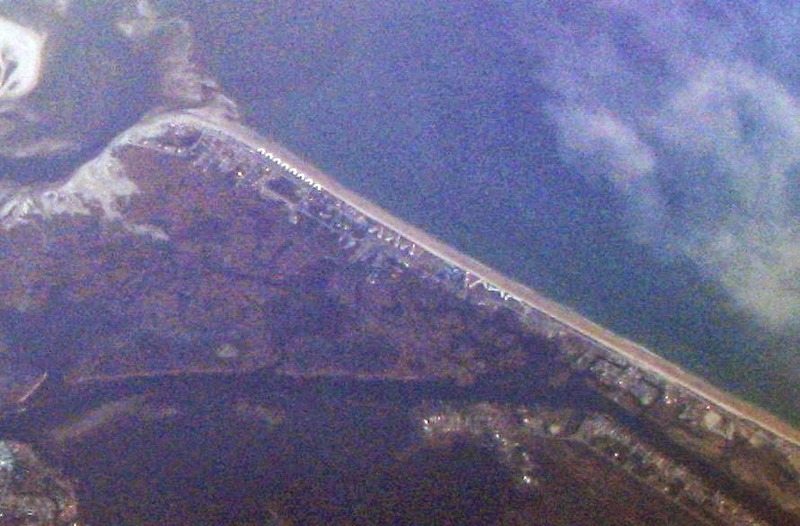 The north end of Topsail Island, NC from 35,000 feet. New River Inlet is at upper left. The weather was clear, so with nose pressed to the window I watched the Chesapeake Bay Bridge pass by below me. Later I noted the west end of Emerald Isle, NC where my family vacationed every summer during the 1990's. Next we passed over the north end of Topsail Island--the island my family had more recently adopted as their summer vacation venue. Little did I know it at the time, but I got a great shot from 35,000 feet of the condo that I was to buy in 18 months. 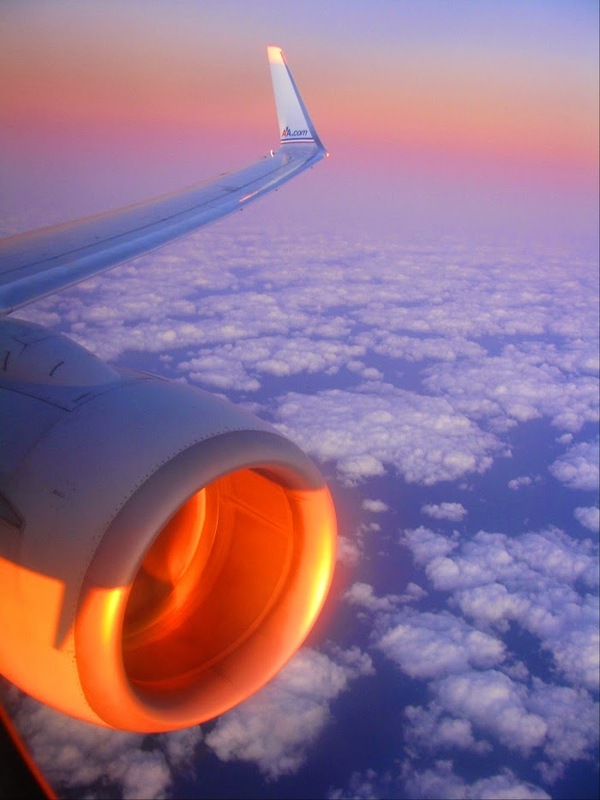 An hour later I watched the setting sun paint the engine of the plane a fiery orange (photo up top). We got to Miami only about 20 minutes late, and I had a great view of the downtown Miami nighttime skyline as we approached the airport. We lost 15 minutes sitting on the tarmac waiting for a gate to become available. Once I was in the airport I found out that I had a long walk, from concourse D to concourse J, and would have to go out and come back in through security. Bad omen? With the late arrival I only had about an hour and a half before the plane for Santiago, Chile left. Fortunately my luck held. I found only a short wait to get through security, and this time they didn't do a 'powdery substance' check so the process went even faster than at BWI. I got to my departure gate with an hour to spare. The boarding began in less than a half hour--very big plane and nearly full to capacity. I had a window seat one row from the back, as requested. Of course the Gulf of Mexico in the dark wasn't going to offer many good views. This was a LAN Chile flight - the staff's first language was Spanish. The plane was immaculate--nearly new, with all the latest techno-gadgets. And clearly LAN's service did not suffer the customer-hostile cut-backs that US airlines have implemented. We didn’t have to pay for blankets or pillows, we got two hot full meals of good quality food served with free wine (! ), and they came by frequently, offering all the different non-alcoholic drinks I wanted. My seatmate was a biker from New York who was trying to travel the whole world by motorcycle--in this case, rented. He was going to be touring around Chile for a week. The flight time was 7 hours and 45 minutes overnight, and I am incapable of sleeping on a plane. With my long legs and the narrow seat, I feel cramped--literally. So the long international flight was torture as usual. And as usual I didn’t sleep more than a few minutes. They served dinner and then turned off the lights around 10:30PM. I got out Silmarillion and tried to read as I suffered through the night. Tomorrow - Chile! Santiago and the Atacama desert.